Construction of environmentally friendly houses is a new trend in modern architecture, which benefits both to art and energy efficiency. Multiple definitions might be provided to enclose main purposes and peculiarities of such housebuilding, but the prime idea is finding a way to live in harmony with nature. To give some details, there are some requirements if to construct an eco-house. Firstly, it should be made of local materials, which are low-cost in the context of production, processing, transportation methods and letting to apply the house building technology without heavy equipment. In this way, after accomplishment of exploit period the materials used might be utilized just on the site. Small financial expenses facilitate the availability of ecohouses to the majority of people. Secondly, energy efficiency systems contribute to living in a harmony with surrounding environment. 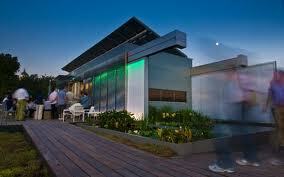 In particular, they include solar panels embedded on the roofs, small wind turbines, geothermal power generators, etc. Thirdly, residence in ecohouses stipulates the engagement in essential biointensive technologies usage, which emphasizes processing and recycling of organic wastes and improvement of soil fertility. In the majority of cases it is associated with agricultural activity featuring cultivation of compost plants and organic farming. Ecohouse must ensure the accumulation of environmental resource area, on which it is built. There are several magnificent examples of ecohouse building, which alert an attention by brave ideas and original construction. One of the recent advancements is observed in Peking, where this architect trend is performed not by single house, but the whole apartment complex. To be more précised, Linked Hybrid (the project name) is based on the geothermal power generators: the heating is provided by 660 geothermal springs located on the 100-meter depth. The entire complex consists of 8 linked buildings, maintaining 750 apartments, cinema, school, hotel, sport facilities and department stores. The total area is 220 thousand square meters. The other green technologies, embedded in Linked Hybrid Project, are recirculation of water and greenery on roofs. Hence, ecohouse building involves not only separate suburban houses, but the apartment complexes in the hearts of urban living nowadays. It is also appropriate to name the best example of ecohouse construction in the world. Lumenhaus in the United States is a true reflection of scientific breakthrough and exquisite architect style. The achievements of Lumanhaus include low cost, simplicity and, of course, energy efficiency. The energy support of the building is ensured by 45 solar panels, implemented on the rooftop and along the perimeter (the total area is 72 square meters). The architect merits were estimated from the point of ergonomics: the house is opened and spacious enough to change a room configuration in correspondence to owner’s preference. Notwithstanding architect art engagement, ecohouses appear to be systems with positive ecological resource. Therefore, their main value is in establishing a compromise with nature and further improvement of human-environment relationship. Most geothermal energy plants inject water deep into the ground where the earth’s heat energy turns it into steam used to generate electricity. The wastewater from this process is full of elements that are not abundant on the surface and that includes lithium. Without going too far into battery technology lithium batteries last four times as long as conventional ones and can deliver a lot of energy quickly. The latter feature is extremely useful for electronics and hybrid cars. The 150 MPG cars you hear about are made with lithium-ion batteries. This is a great example of a change needed at the demand level. Energizer makes them but the cost makes them a rare purchase despite the advantages. A synergistic relationship between battery makers and geothermal energy producers is very important. The educated consumer will buy them but needs to realize that you get what you pay for and 99 cent batteries last only hours. The best and most plentiful source of power on this planet is geological activity. I have mentioned this belief before particularly when talking about what exactly the oil companies will do when the oil runs out. I have recently become a resident of the State of California so instead of trying to cover national companies, I will focus on companies in the Southwest in addition to ones in New England. This corporation has a longish history of natural gas plants in Wisconsin and the Southwest and has a truly sustainable geothermal plant in Northern California. It is estimated that the development meets 60 percent of the power demand for the coastal region between the Golden Gate Bridge and the Oregon state line. The Geysers, a geothermal power field located 72 miles (116 km) north of San Francisco, California, is the largest geothermal development in the world. . The Geysers consists of 22 separate power plants that utilize steam from more than 350 producing wells. The Calpine Corporation operates and owns 19 of the 22 facilities. The other three facilities are operated by the Northern California Power Agency and the Western GeoPower Corporation. geo-thermal power and build gas-fired power plants internationally. portfolio including natural gas related interests. Congratulations to the president for making a good decision, he has done some things well and other poorly but this is a good step. For one, these are the two alternative energy sources that have by far the most potential. Ignoring investment into bio-fuels and wind is very smart. Also the bulk of the money goes towards research and development, which is important because this will allow us to perfect the technologies before putting them into widespread use. $350 million for geothermal shows great foresight as, in my opinion anyway, this is truly a source of unlimited dependable energy. Many will probably aygrue that this money would be better spent on some other part of the economy and as someone who has been laid off due to this recession I can understand the point. However, this constitutes a very small chunk of the overall stimulus package and if you don’t think long term, you’re doomed to live in the past. Plus I plan on having kids and I know they will benifit from this even if I don’t see the results anytime soon. What will the giant oil companies of the world do when production declines and what will they do when the black gold runs out entirely? If the Arctic continues it’s recessive trend, the Exxon-Mobils will have a brief stay of execution with new-found reserves in the former great white north, but then what? They may use their drilling expertise to mine gas hydrates at the bottom of the ocean. I have mentioned that this is really a bad idea. Exxon Mobil is the largest company in the world and something should be done with their equipment and employees, most of the companies are American owned anyway so we have a personal stake in the future of the oil companies…imagine having to bail them out! So the solution is Geothermal. I don’t know if I’ve commented on this before but I believe that Geothermal is the best renewable energy resource we have. —We have perfected the technology of drilling! Ok maybe it’s not perfect but if there is any technology we have improved to the utmost, it’s oil drilling. Bottom line; drilling a big hole is how we harness geothermal energy. So there’s your future big oil, you make a profit no matter what the price per barrel but someday those barrels will be empty.